It’s no secret that the decision to buy or sell a family home is a major lifetime milestone. Few financial transactions will ever be larger for most families. Understandably, it can be a stressful and demanding time as well. Everyone involved has their own stake in the process. The Buyer wants “that ideal home where they can spend their future years secure, happy and free from unanticipated complications”. The Seller wishes to obtain the best price for a wonderful home in order to move on to the next chapter in their life. The Real Estate Professional has a desire to bring both parties together and consummate the purchase as quickly as possible. The Bank or Mortgage Company wants to be sure that its loan is backed by a valuable and marketable property. It is in this very time that misunderstandings occur or mistakes are made and most often unintentionally. This is why and when you need my services as a Certified Professional Home Inspector. 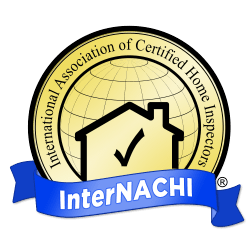 As an InterNACHI Certified Professional Home Inspector, I voluntarily hold myself to higher standards than most home inspectors. Buying a home, as you know, is a big decision, and you deserve the best home inspection possible! Below are just some of what I do to be an InterNACHI Certified Professional Home Inspector.